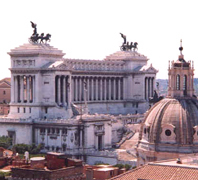 ROME WAS FOUNDED 753 Y. B.C. Faustolo (around 790 years before Christ) saw a big she-wolf with two twins children sucking her milk. The legend says that once ROMOLO and REMO learned their story decided to go back to Albalonga. Here they punished the cruel Amulio and set free their grandfather. They went back to the Tiber banks where they had grown up. Here they founded a new town. But who would decide the name? During the Copper Age the Alban Hills area (south of the Tiber's mouth) was inhabited by an Italic agricultural and pastoral tribe called Latini. It was due to them, that Rome was founded towards the middle of the 8th century BC on one of the numerous hills (the Palatine) in the marshy depressions surrounding the river. The town and territory occupied by the Latini expanded gradually during the royal period (753-510 BC), under the seven kings of Rome: Romulus, Numa Pompilius, Tullus Hostilius, Ancus Marcius, Tarquin Priscus, Servius Tullius and Tarquin the Proud). In this period the juridical and social organization of the new nation evolved, revealing clear influence from the nearby Etruscan civilization.Territorially, at the end of the 6th century BC, Roman Lazio extended over some 2000 sq km. It covered the lower Aniene Valley as far as its junction with the Tiber and from there to the sea, besides including the major part of the Alban Hills and the coast from the mouth of the Tiber to the promontory of Anzio. ...ITALIAN REPUBLIC With Rome predominance in Central Italy consolidated, Rome prepared to extend it over the rest of Italy during a ten-year conflict with Taranto (282-272 BC), who was allied with the king of Epirus, Pyrrhus. While they enjoyed a modest victory at Ausculum (279BC), they were heavily defeated at Beneventum (275 BC). Rome thus achieved total supremacy of the Italian peninsula and set up a complicated system of alliances between the territory of Rome, towns and colonies enjoying full or partial Roman citizenship ('civitates sine suffragio') and the others who, while being independent, recognized Roman sovereignty in the context of a confederation extending over some 130,000 sq km and equipped with well over half a million soldiers Romans and allies. The economy of the whole Italic federation, whose territory now extended from Tuscany (through Piza-Pistoia-Fiesole-Rimini, but excluding the upper course of the Arno) to southern-most Calabria, was strengthened by the construction of the first important inland road, the VIA APPIA, from Rome to Capua and Benevento (312-268 BC), as well as the development of the fleet and marine transport. At the same time the monetary system was expanded with the minting of bronze (300 BC) and silver (269 BC) coins. ... The Christian church continues the authority and prestige of Rome, in particular the Popes as Leo I (440-461) and Gregory the Great (590-604). 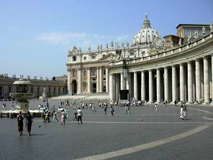 The church also assumes political and administrative functions whit repeated territorial acquisitions (St. Peter's patrimony). The 4th century AD began the western monachism, with St. Benedict of Nursia (480-543AD). The Benedictine monasteries and abbeys, became the early Middle Ages not only places of religion but centres for the preservation and spread of culture. They define the drainage and use the lands devastated and depopulated by recurrent war. The papacy, monasteries and other ecclesiastical institutions found themselves in possession of huge estates, often enlarged by further donations, that contributed to strengthen their political authority and power. The bad relations between Theodoric's successors and the Eastern Empire offered the emperor Justinian (527-565AD) the opportunity to re-unite the Empire. 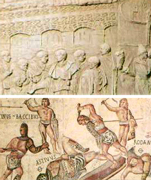 This starts a difficult conflict, the Graeco-Gothic War (535-553AD), which had grave consequences for the Italian territory as it was placed under the government of the Exarchate of Ravenna. ITALIAN RENAISSANCE, The scarse inclination of the newly-formed urban middle-class for military activities let to a search for the protection and support of their interests by the powerful feudal families. In a short time, although in the name of the people, they acquired the signoria or lordship of the old communes. In this atmosphere of renewed vitality, culture also prospered with a new enthusiasm for the study of the classical world and a revaluation of interest in nature and man (humanism). The arts (from literature to the expressive and figurative) had one of their finest moments. The appearance of towns was transformed with the introduction of new styles of architecture. 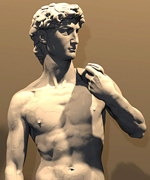 During this period Italy indeed became the cultural centre of Europe. Among the young Italian signorie in the second half of the 14th century, the most ambitious proved to be the Visconti, who had succeeded the Torriani in governing Milan (1350AD). 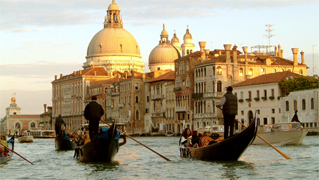 ITALIAN RENAISSANCE, ... On the death of their founder Gian Galeazzo in 1402, the ambitions of the Duchy of Milan were reduced and Venice, having subdued the other Venetian signorie, succeeded in advancing as far as the banks of the Adda. In the meantime also the Florentine republic was drawing to an end. In 1382 the last corporations represented in the city's government were removed and an oligarchic regime installed that would later lead to the signoria of Cosimo de' Medici (1434). While several years later the king of Sicily, Alfonso d'Aragona, seized the throne of Naples (1442) and the Visconti of Milan were replaced by the Sforza (1448), after the brief interlude of the Repubblica Ambrosiana.